Jockey Sean Bowen scored his first Grade One win in the £180,000 Ryanair Stayers' Hurdle aboard the Harry Fry-trained If The Cap Fits, who stepped up to three miles for the first time. Seven-year-old If The Cap Fits got the best of a thrilling three-way finish with 5/6 favourite Apple's Jade, eventual third, and runner-up Roksana (10/1). If The Cap Fits won by a head at odds of 7/1, with Apple's Jade a neck behind Roksana. Bowen said: "It's unbelievable, I can't believe it, it's brilliant. Harry has obviously been great to me this season and it's fantastic to repay him with a winner like that. It's nice to get Noel [Fehily, who recently retired from race-riding] out the way as well!" The son of Milan had previously been ridden by Fehily, who retired from race-riding at the age of 43 last month. Fehily was one of the first to congratulate Bowen. Bowen continued: "If The Cap Fits has a lovely way of racing over three miles. He relaxed beautifully, travelled really well without being too keen and jumped really well, bar the last when I needed a good one. He missed that and I thought, 'race over. I'll wait a bit longer for my first Grade One winner'. "There wasn't a whole lot of room; he did very well to battle between two horses getting sandwiched like that, and the two mares were getting 7lb off him as well. He was tough from the back of the last and he's a gutsy horse. "Everywhere I went, I couldn't have been happier with the way I was going. I was tracking the right two into the straight, and obviously the question mark was whether he would get the three miles, and he got it very well." If The Cap Fits (7/1) survives a last hurdle blunder and a three-way photo to collect the G1 Ryanair Stayers' Hurdle by just a head and a neck from Roksana (10/1) and the 5/6 favourite Apple's Jade. If The Cap Fits is owned by Paul and Clare Rooney and it is the seven-year-old son of Milan's first Grade 1 success. It is also trainer Harry Fry's first victory at the Randox Health Grand National Festival. "I thought the mistake at the last that was us cooked and he had every excuse after to give up - he didn't have much room, the gap was closing, but he wanted it and he toughed it out," said Fry, adding: "The step up in trip to three miles has worked and I am delighted - Paul and Clare are here today, it is a fantastic occasion. "He has been a really consistent horse all season, we've always thought he that he is high-calibre horse and now he is a Grade 1 winner! "It has been a great team effort, these Grade 1s are pretty rare to win. Jockey Noel [Fehily], who has recently retired, always thought a lot of the horse. He put a lot of time into the horse and has been integral to bringing the horse to this point. Sean has been the beneficiary today and he is a fantastic young jockey - it is his first Grade 1 win and I am delighted for him. "Last year If The Cap Fits was fancied for the Supreme Novices' Hurdle, but he had a set back and we had to miss that, but Paul and Clare said to just be patient and to give the horse a chance - I am delighted for them to get a big winner on this big day." Owner Paul Rooney was all smiles: "He was very tough out there. I thought up the straight we were running out of petrol, but he dug in and he got there. He stumbled at the last and did so well to get back up." Go Cconquer, trained by Nigel Twiston-Davies, runs for the Rooneys in the Randox Health Grand National. Roksana (10/1) might have been lucky to have been presented with the G1 OLBG Mares Hurdle at Cheltenham when Benie De Dieux came down at the last, but there is no questioning her status as a proper Grade One filly after her head second to If The Cap Fits (7/1) in the Ryanair Stayers Hurdle, which with front-running Apple's Jade (5/6 favourite) only a neck away in third was unquestionably the finish of the week so far. Trainer Dan Skelton said: "The winner's knocked the last out of the ground and still got up, so fair play to him, but we were in front strides from the line and it was a fantastic run. "She'll go on holiday now, and then it will be one run before Cheltenham again and then come back here again. She's been second in two Grade 1s here now (also second in the Doom Bar Sefton Novices' Hurdle at this meeting last year). She was a fortuitous winner at Cheltenham obviously, but don't be doubting her ability." Jockey Harry Skelton added: "She's probably run a career best and really backed up her run at Cheltenham. She's a good mare and we'll be back again next year. "It's great to be part of such a good race. Three good horses, battling it out on the best day of the year. People should enjoy that. It's what racing is all about and everyone should get behind it and all stand strong as a team." With seven runners in the Randox Health Grand National, and Apple's Jade as favourite for the G1 Ryanair Stayers' Hurdle which his company sponsors, racehorse owner Michael O'Leary was a man to envy at Aintree today. 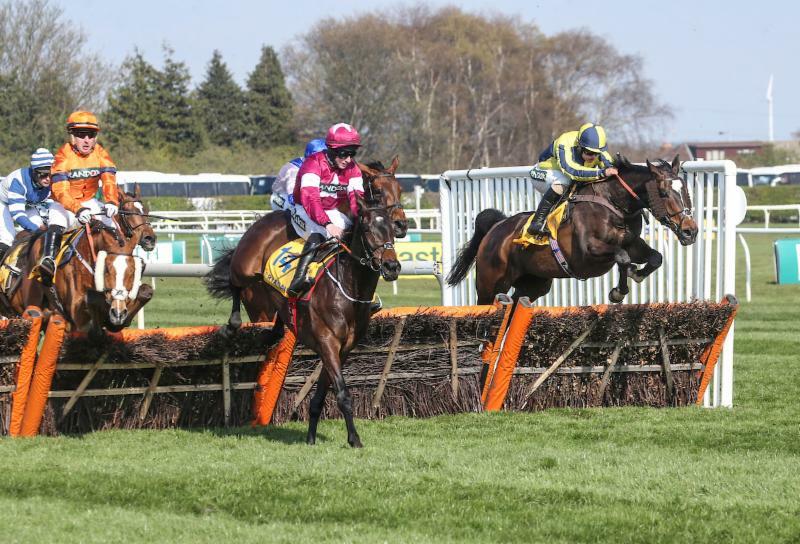 He was philosophical after Apple's Jade finished third - following a three-way battle that could become the race of the Festival - and he was unequivocal that Tiger Roll, who he also owns, has too much weight to win back-to-back runnings of the big race. The Jack Kennedy-ridden Apple's Jade (5/6f) was beaten a head and a neck by If The Cap Fits (7/1) and Roksana (10/1). O'Leary said of Apple's Jade: "That was a big improvement on her run at Cheltenham [when sixth in the G1 Unibet Champion Hurdle], following which she scoped badly. She could have run terribly today, she could have run well - she was just jumping out to her right a little which may have cost her, and she didn't do that over two miles at Leopardstown in February when they were going that bit quicker and she had less time to be fiddling them. "Take nothing away from the winner, who is a fine horse, and well done to the Rooneys [Paul and Clare, who own If The Cap Fits]. I prefer my horses to win, but I struggle to win these Ryanair races [which he sponsors] and think they should change the sponsor!" Of Tiger Roll, he said: "I'm nervous for him because he's got to the stage where I just want to see him come home in one piece. I think he has too much weight. He's a small horse, and barely scraped home last year. He's got 6lb more to carry this time. I don't think it's his year and believe it will be won by a horse lower down the weights. If I can't win it I'd love to see Rathvinden win for [owner] Ronnie Bartlett. "Of my other horses, something down the weights like General Principle, Monbeg Notorious, Dounikos or A Toi Phil could run well, but history tells you horses that carry 11st 5lb or more don't win the National. I don't think Tiger Roll will win today. I just hope they all come home safely." Jack Kennedy who rode Apple's Jade, said: "It's disappointing to be beaten on these big days, but she's run a cracker. She ran her heart out, and while she made a mistake at the last, the winner made a worse one - we're happy enough."